Ed leads the Trust’s strategy work and partnership development, his background is in social venturing and public policy. He joined the team from the Cabinet Office, where he led the government’s work on innovative finance – blending philanthropic and commercial investment to scale social ventures. Tesla’s Roadster is hurtling towards Mars at over 34,000 mph, but back on earth, the company seems to be moving at a somewhat slower pace. Production problems have limited the company’s ability to meet demand, but perhaps their biggest threat is the increased competition as electric vehicles go mainstream. Volvo’s move to make all its new cars electric or hybrid by 2019 is the latest step to introduce more competition to the luxury end of a growing market. It may feel like a headache right now, but in terms of their vision to accelerate the world’s transition to sustainable energy, the increased competition in the market is a clear marker of success. Wherever the company goes from here, its impact on bringing the cool to electric cars and putting a rocket boost under the industry cannot be underestimated. At Nominet Trust we support promising ventures with a social mission to develop and grow. But for us, that’s not an end in itself. We see the massive potential of tech to deliver positive social and environmental change and want to see that potential realised. For that to happen, we believe that there needs to be a more fundamental change; a switch from tech being applied to social issues, to social transformation being the driving force behind tech. Despite its current woes, Tesla is a great example of this. They sought to accelerate the world’s transition to sustainable energy by proving that people didn’t need to compromise to drive electric vehicles. Their purpose is the bedrock of the company and central to the decisions they make. Contrast this with Facebook. Despite being the world’s leading social network, the company lacks a deep social commitment and for too long has seen itself as a tech platform, dissolved of responsibility for what happens on the platform or to the data that it generates. If such a social purpose had been built in from the outset, would the company be where it is now, answering to the US Congress, UK government and others? Would it have needed to rapidly back pedal from a highly questionable position on data integrity and ethics? Would it be apologising for mistakes that its own founder and CEO acknowledges will take many years to fix? Can social transformation really drive tech? Our vision looks to the long term. But the work of the Trust and others means that we’re much closer to achieving it now than we were when we started a decade ago. During this time, much has changed. Ten years ago, the concept of social tech didn’t exist. Since then we’ve invested over £30m into ventures and intermediaries, helping to build a thriving community and ecosystem of entrepreneurs, investors and advocates. Our funding and support has directly benefitted over 350 organisations, the majority of these are early stage ventures with impressive prototypes and models for growth. So, why haven’t we seen more examples like Tesla? The tale of Tesla and its visionary founder is compelling. But what we often fail to hear is the back story of the tremendous amount of subsidy and investment into building the knowledge, networks and infrastructure that provided the platform for Tesla to succeed. Tesla catalysed the market and made the public and industry sit up and take note, but the infrastructure and demand for electric vehicles had been built over a much longer period. And that’s where we see similarities. Over the last decade we’ve seen some exciting shifts in the way that people and businesses think about the society they want to be part of and their role in making that a reality. These changes suggest that the world is now more ready to see and demand that tech demonstrates its power as a force for social transformation. The public, you and I are starting to ask more questions about how businesses work and how we want to interact with them. As Edelman’s recent brand study found, 50% of consumers are willing to choose or boycott a brand because of its position on a social or political issue, something that will be put to the test as we see how Facebook and its users respond to the current turmoil. These changes are starting to have an impact in the business world. Large corporates are increasingly recognising that their commercial results are inherently linked to the social environment in which they operate. Some companies, like Unilever, Danone and Novartis, have taken this further and implemented shared value approaches, which deliver commercial success by identifying and addressing social problems that intersect with their business. And it’s not just about big business. The rapid rise of the B-Corps (which now boast over 2,500 certified companies) and the impressive rate that social businesses are starting up, reflect a greater awareness of the relationship between business and society. And whilst changes are happening in the way businesses operate, they’re also happening in the way they’re funded. The growth of impact investing has seen a massive increase in the amount of socially motivated capital. In the UK, we’ve witnessed the development of the world’s leading social investment market, which channelled £1.5bn into social businesses in 2016. These changes speak to the ways that businesses operate as a whole. For tech specifically, they create an intriguing platform for change. Heightened scrutiny from government, regulators and the public has created a period of introspection. Whether it’s how companies treat their employees, monetise users’ data or engage with potential investees, there are growing calls for greater social consciousness and the momentum is not giving way. So, what does this mean for social tech? We believe that much of the infrastructure is now in place. There is a growing pipeline of start-ups and established organisations, whether in the public, private or social sector, who are engaging with tech in new ways. There is an increased awareness and interest from social and mainstream investors. And there are growing communities of entrepreneurs, developers and tech advocates building the networks that underpin change. But there are still gaps, which is why we’re focusing on three main challenges that we believe will help make our vision a reality. Not many social tech ventures have the profile of Tesla yet, but we don’t think that moment is too far away. We’re already backing a number of inspiring ventures who are no less visionary and are already transforming lives in the UK and beyond. Ventures like Open Utility who, through their Piclo peer-to-peer platform, are quite literally decentralising power so that homes and businesses can participate in local renewable energy markets; Troo.AI, who are applying conversational artificial intelligence for human benefit; and Alice, who are one of a new wave of companies using blockchain to bring greater transparency to the way that charities and NGOs go about their work. Image courtesy of Alice: Working with St Mungo’s, Alice aims to help get 15 homeless people off of London’s streets using their transparent donation platform. What these ventures have achieved in a short amount of time is impressive. But, we also know that as social tech pace-setters, they have faced barriers. The current investment landscape is not set up to support ventures like these. Commercial venture funds, with the expertise in building and growing early stage ventures often focus on returns and time horizons that can make social tech propositions seem unattractive. Meanwhile, social investment is heavily weighted towards debt investments, with few investors experienced in making equity investments in tech. By working in partnership with others, we want to increase access to capital, so that, like their peers in the commercial tech sector, the strongest ventures can make the transition to operate sustainably and at scale. There is currently a healthy pipeline of ventures with great ideas coming through. But we believe that more could be done to make sure that the strongest ventures get the backing they need. Our last grant funding round attracted 350 high quality applicants, with working prototypes that they were seeking to test and get investment ready. Only eight of those went on to receive the vital early-stage funding they were seeking. That could be interpreted as healthy competition, but with limited alternative sources of funding, it’s likely that high-potential ventures are not getting the support required. We know there is quality out there and we want to encourage more to come through. This means that we and others need to be willing to take the risk and make more capital and support available to back ventures when they are starting out. If more social tech ventures are to scale, they need access to all the support that’s out there. We know that the term social tech creates a bit of an artificial divide. The ventures we’re talking about don’t fit neatly in the social sector, nor do they always find a comfortable home in the commercial tech space. They are organisations or companies with a social mission and that drives their use of tech. Initiatives like our NT100 campaign and the Our Lives + Tech podcast series help to raise awareness of the ground-breaking work these ventures are doing. But more needs to be done to make sure that when we talk about the UK as a tech nation, the networks, infrastructure and £6.8bn of tech investment is genuinely accessible to social tech ventures. 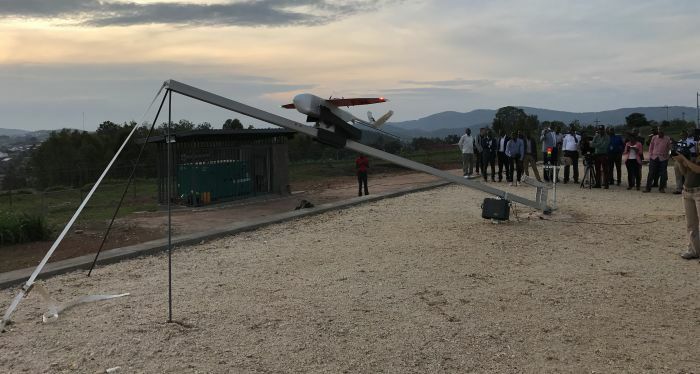 Image courtesy of NT100 venture Zipline: A Zipline drone delivering medical supplies in Rwanda being launched at sunset. What do we want tech to do? Scrutiny of companies like Uber, Airbnb and Facebook is healthy. Tech can be an amazing force for good, but it’s not implicit. That means it’s down to us to engage with tech in a different way and ask what do we want tech to do? Financial services continue to struggle to retrofit impact onto a system – and culture – that is largely at odds with a worldview that recognises value beyond financial metrics. For tech, the current malaise opens the door for the sector to define its own path. If social transformation is to lead the way, it’s critical that we understand what challenges we face and what opportunities there are for tech to address them. That means learning from Silicon Valley and the journeys of the Unicorns. It means engaging with and influencing the infrastructure and systems that already exist. But it’s also about recognising that this is different – and for good reason.